Alaska Station Sets Dubious Record: Most Senate Campaign Ads : The Two-Way The Center for Public Integrity calculates that KTUU in Anchorage ran more U.S. Senate ads this cycle than any station in the country. 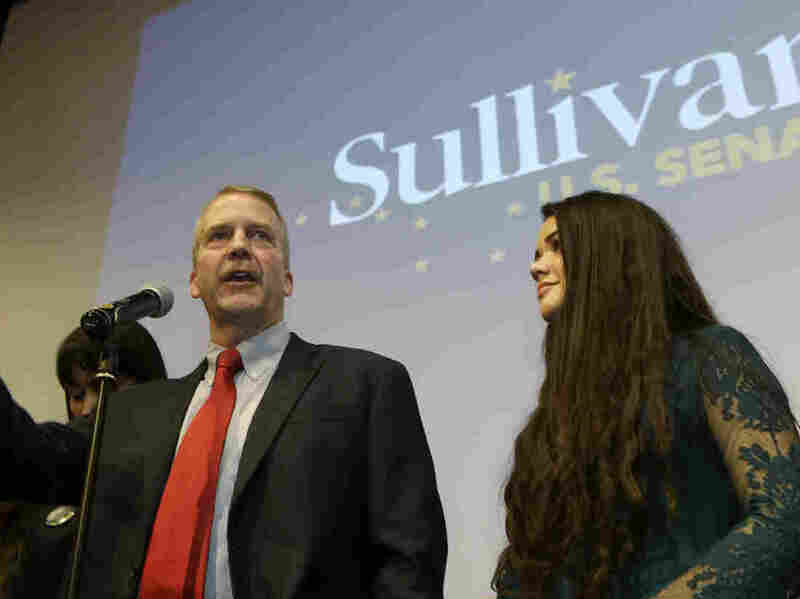 Republican U.S. Senate candidate Dan Sullivan greets supporters on election night in Anchorage. The as-yet-undecided race between Sullivan and Democratic incumbent Sen. Mark Begich was the hottest in the state. It's a record most Alaskans might wish they could give back: The Center for Public Integrity calculates that KTUU TV in Anchorage ran more U.S. Senate ads this cycle than any other television station in the country — 12,300 in all. Those Senate spots made up the bulk of the 13,400 political ads since January. KTUU General Manager Andrew MacLeod says 2014 was the the station's busiest year ever. By contrast, off-year 2013 was relatively light. Besides gubernatorial and U.S. Senate primaries, the election year also brought out advertisers for key ballot measures, including those for legalizing recreational marijuana, raising the minimum wage, and empowering he legislature to block a controversial mine near the Bristol Baby Fisheries Reserve (they all passed). But the hottest battle was the Nov. 4 face off between Democratic Sen. Mark Begich and Republican challenger Dan Sullivan. By Thursday it was still undecided, with Sullivan holding an 8,000-vote lead and Begich holding out until some 20,000 uncounted ballots can be tallied. Besides the candidates and the party committees, the Wesleyan Media Project tracked 22 outside groups buying TV time for the race. It estimates they aired more than 58,000 ads. The Sunlight Foundation reported late in October that all those advertisers spent $120 per voter –- more than triple the figure for any other Senate race. Even so, Tuesday's turnout was about 15 percent lower than Sunlight projected. On Thursday, the online Alaska Dispatch calculated that overall spending by the candidates, party committees and outside groups came to about $225 per voter.